but all opinions within are my own. I think 2016 might have been a peak for “bowl meals,” but I hope it’s still cool that I’m on the bowl bandwagon– because bowl meals, like this Vegan Burrito Bowl, deserve to stick around. They’re just so convenient and satisfying! What’s cool about the Nutri Ninja® Nutri Bowl™ DUO™ is that it is a personal-size blender and food processor in one compact machine. 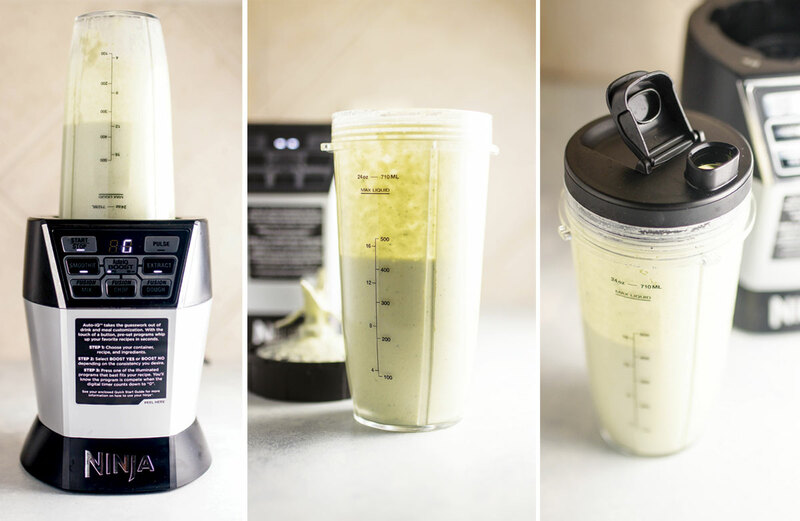 I’ve used it to make my morning smoothies, and it breaks down even my toughest ingredients like dates, chia seeds, and ice cubes into a smooth and creamy, milkshake-like consistency. This is the feature that sold me on this machine, as I’ve never found another blender at this price point that can break down my smoothies so well. 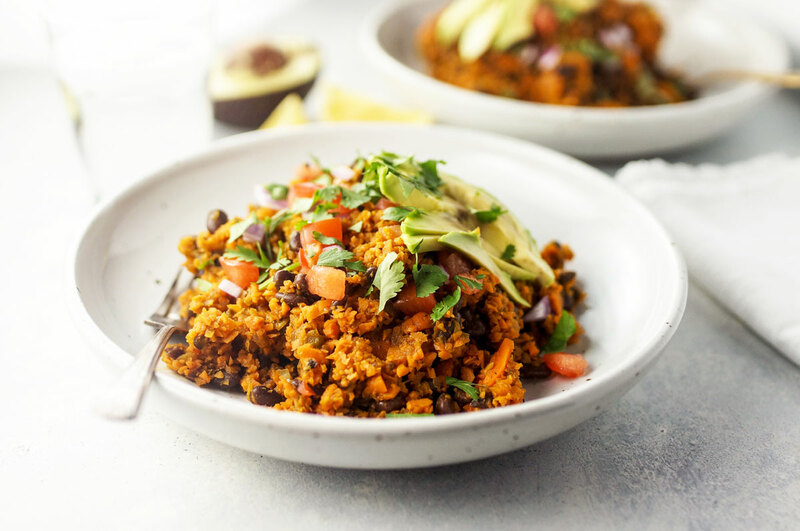 This machine also comes with a bowl attachment, so you can whip up your favorite dips, like my Zucchini Hummus, quickly chop veggies for a weeknight stir-fry, or easily create veggie rice to use in recipes like this vegan burrito bowl with sweet potato “rice”. It’s a perfect mini food processor! I hope you’ll enjoy this Vegan Burrito Bowl, featuring sweet potato “rice” as a more nutrient-rich base. It takes less than 30 minutes to prepare, and makes a comforting winter meal that is naturally gluten-free and loaded with nutrients. For a paleo alternative, feel free to skip the beans and add in your favorite high-quality protein of choice. Note: You can speed the chopping process by using the Nutri Ninja® Nutri Bowl™ DUO™ to dice the red onion, pepper, and garlic. I did this first, then processed the sweet potato rice while the veggies were sauteeing, to use my time as efficiently as possible. Hope you enjoy the burrito bowls! Reader Feedback: Have you tried making “rice” out of any other veggies? 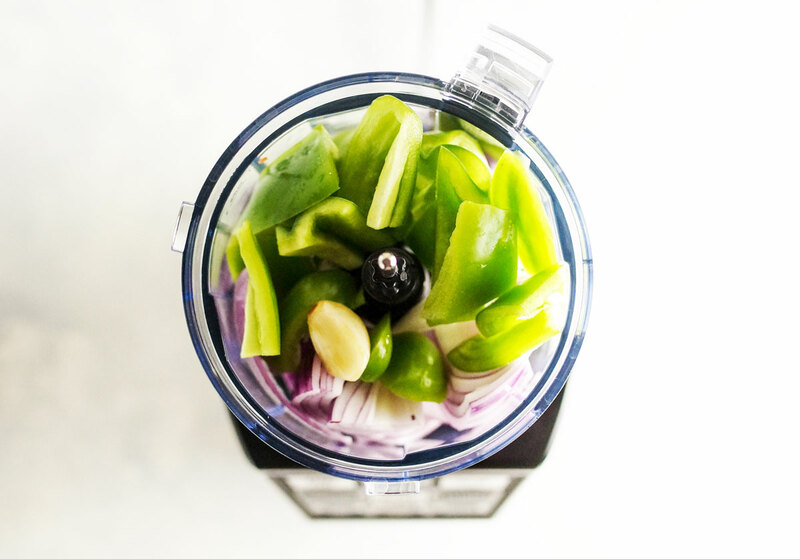 I would love to use the Ninja to blend creamy, vegetable packed smoothies for my picky toddler! It’s a struggle to get her to eat a full serving of vegetables every day. Luckily I am able to sneak some into her smoothies, but my current blender can’t break down the tougher, more fibrous vegetables she needs. Definitely almond flour and riced cauliflower. sweet potato/cashew legume-free hummus, avocado “mayo”, nut butter/avocado/fruit bowls. Smoothies! My old Cuisinart mini chopper bit the dust and my OLD OLD Waring Blender just can’t hack it. I’m in the everloving debate on which whizzer-upper to spend my hard earned greenbacks on. I would just eat healthier in general…more homemade stuff, not boxed or bagged. Smoothies, for sure and butternut squash “pilaf” with spicy vegan chorizo sausage and a roasted red pepper cashew cream sauce. And nut butter! Would make the Sweet potatoes rice, dressings, love the pourable container. ?? Not to piggy back, but this recipe is what caught my interest. I never thought to use sweet potato as rice! I would also love it for smoothies. Been doing the 3-week plan you created and this would be incredibly helpful in continuing on. My food processor actually broke, so the timing is perfect! I would first use it for my go-to nut butter date paste (soaked dates + lots of nut/peanut butter + small amount of date sweetened water to keep its thick consistency)! Other recipes would include: your chocolate chia pudding, cashew cream, dressings and sauces, nut butters, chocolate peanut butter shake. In my college apartment, my kitchen is tiny, so this compact size would be perfect for my counter space. Plus, the clean-up sounds like a breeze! I would make salsas & smoothies, but I’m also going to make this recipe. Thanks for sharing. Salad dressings. I like it that it stays in the container that it is made in. Less clean-up! This recipe! Smoothies, dressing, hummus, cauliflower rice! Pick me pick me!! I love all your recipes and smoothies and have a nutribullet that is giving up the ghost… I would love to have the ninja for the chocolate cherry smoothie and try the vegan sweet potato burrito bowl as well – yum! 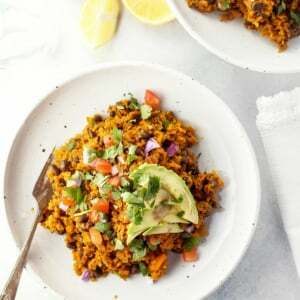 This recipe looks great, I would like to try the sweet potato rice. I’d definitely start with the recipe above. 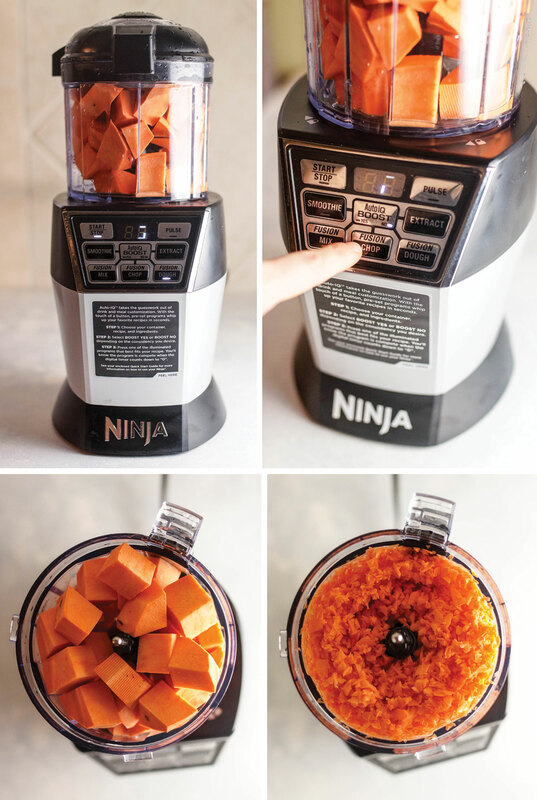 I love sweet potatoes spirialized, so using the Ninja to make sweet potato ” rice” sounds yummy. I’d love to make my own salad dressings! I would make acai bowls! I found your review enlightening since I saw the Nutri Ninja Nutri Bowl DUO; I currently have the Nutri Nija and its great for smoothies. I like the idea of blending/chopping items together and then using the same container to store it. Makes its so much easier since I’m now an empty nestor and I’ve had to cut my recipes in half this would make it so much easier. Thank you for your review! I’ll be starting with your Vegan Burrito Bowl with Sweet Potato “Rice” followed by your Mexican Butternut Pilaf from Everyday Detox. Oh, and then there will be the salad dressings…oh yum! This would come in so handy! there’s a lot of recipes that you’ve posted I haven’t tried because I don’t have a blender ? Fingers crossed! Would love to use it to make this recipe. Trying to get more sweet potatoes in my and my family’s diet. I also would love to use it to make my daily smoothies and I absolutely LOVE the Classic Greek Salad Dressing. So yummy! I’ve never heard of “ricing” sweet potato, so this recipe would definitely be first on my list. I would also use it to make my daily protein smoothies. Would to use it to make this recipe. Trying to get more sweet potatoes in my and my family’s diet. I also would love to use it to make my daily smoothies and I absolutely LOVE the Classic Greek Salad Dressing. So yummy! I cannot wait to try the recipe and the blender! I’d be able to make any recipe in your first book, especially the stir fry with cauliflower rice! Of course smoothies are a must as well and I will them with my twin! I love that this ninja makes smoother smoothies. I would make those. I also thought the burrito bowl with sweet potato rice sounds so tasty. I’m looking forward to trying your recipe. I love that you can blend your dressing and keep it in its own container. Sounds perfect! And I’d definitely try out this recipe! I would definitely be using it to make “rice” with sweet potatoes, butternut squash and cauliflower. I love the idea of the make and store dressing . Date bars, smoothies, hummus, dressing, etc!! I would love to use this machine to try making homemade nut butters with various nuts and flavors! This recipe! Cauliflower rice and smoothies! I have a wonderful Carrot ‘rice’ I make with onions and seasonings. It would be nice to make this with the Ninja Bowl as it would be simpler than the way I do it now. i’d love to use it to make homemade larabars! I would love this for the reason you stated, as a mini food processor! I would make your sweet potatoe rice. That sounds really yummy. I’m not down with the one-dish fad fading out. Excited to be able to make “rice” without a food processor! I would love to use the processor to make vegan cheese from cashews! I would definitely make this recipe! Then I would make some super green smoothies and vegan ice cream. The list is endless! I would love to make this recipe especially the sweet potato rice. Sounds like machine I need. Smoothies and non stop making sauces on top of veggies! Never have to hand chop celery onions and carrots! Blech! I’d use this for my protein shakes and for making hummus, nut butters, coconut butter, and chopping veggies. I love the size of this! Cucumber Tahini dressing ( that was a super hit last weekend! ), lentil hummus, baby food, oat flour, banana ice cream…. 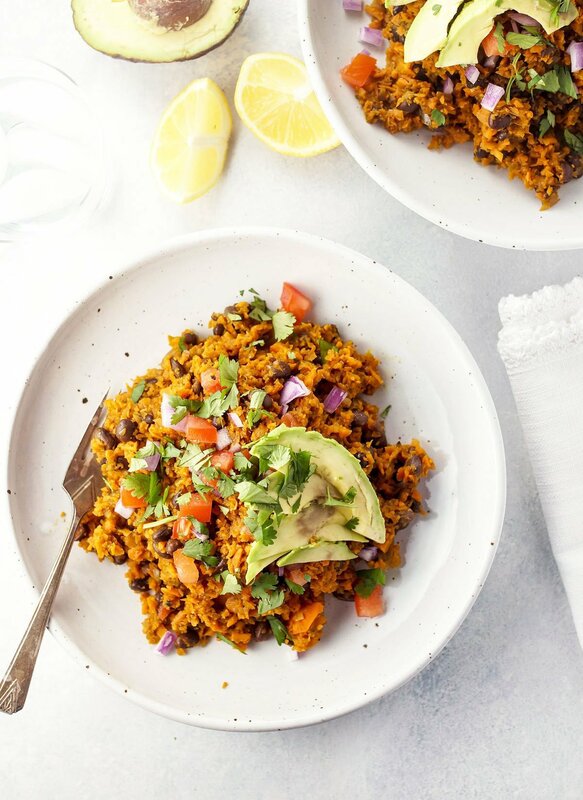 wow sweet potato rice looks amazing!